The remarkably rich stores of GLA in evening primrose oil are what make it so valuable in healing. Taken internally, the body converts GLA into prostaglandins. These hormone-like compounds help regulate various body functions, controlling inflammation in some cases and promoting it in others. The prostaglandins produced from GLA fall into the anti-inflammatory category. The anti-inflammatory effects of Cat’s Claw have proven beneficial in the treatment of arthritis, rheumatism, bursitis and gout. As an antioxidant, it also helps protect cells from damage caused by free radicals. Its beneficial effects in treating arthritis pain may also be due, in part, to its ability to cleanse the digestive tract and aid in removing toxins from the body. Arthritis, joint pain and inflammation as well as chronic fatigue, allergies, immune deficiency and a host of other conditions have been associated with defects in intestinal permeability (leaky bowel syndrome) and toxin overload. 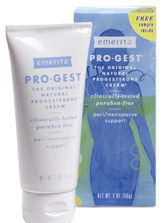 Emerita progesterone cream is the most trusted name in progesterone cream, suppling women on every continent with safe, high quality solutions for womens health.